This year, many trails across the valley opened up on the Closing Day of the winter season, April 15. However, many trails upvalley near Vail are closed until June due to elk migration. Partying in Avon on Saturday, April 14, Nottingham Park revelers weren’t celebrating the end of the ski season. They were ringing in the start of the mountain biking season. This year, the trails in Avon opened on the same day the mountains closed, April 15. In the West Avon Preserve, a 478-acre parcel of town-owned open space on the north side on I-70, trails including the iconic Lee’s Way Down mountain biking trail are now open and can be accessed from the trailhead on Beaver Creek Point road, which has a limited amount of parking available. At the bottom of the West Avon Preserve, parking is also available on the end of Nottingham Road. Trails in the West Avon Preserve can also be accessed from the O’Neal Spur Pocket Park in Wildridge at the intersection of at Old Trail Road and O’Neal Spur. In Edwards, the Knob Hill trail also opened on April 15. It’s located on the east side of Winslow Road, just across from Filly Drive, and parking is available at the community center at the corner of Winslow Road and Singletree Road in Edwards. From the Knob Hill trail, you’ll see into the West Avon Preserve and the Wild West Ridge trail, which also opened on April 15. The trails in and around the town of Eagle are now open as well, offering more than 100 miles of soft surface singletrack. 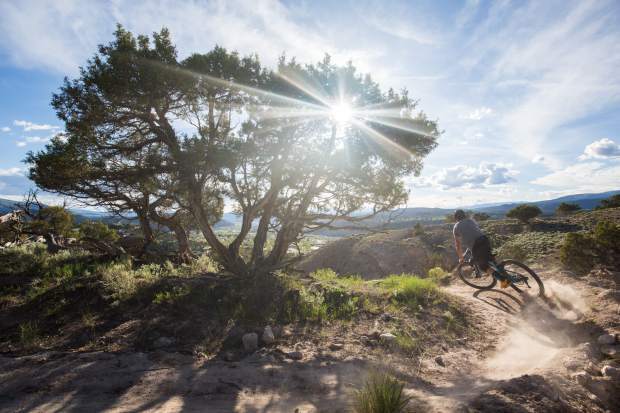 Popular favorites include the Pool and Ice Rink trail and Haymaker trail, which is used for the high school state championship mountain bike race and has both a pump track and a BMX track located near its trailhead on Brush Creek Road. Cruising through town, you can use singletrack sidewalks to get around in the Eagle Ranch area, the singletrack sidewalks were recently expanded and offer an alternative to pavement for those looking to connect from one area to the other. The singletrack sidewalk trails are great for beginners and can be used to travel between trailheads for those looking to get around town on their bikes. A portion of the singletrack sidewalks in Eagle Ranch can be ridden by those attempting to connect from the trailhead at the Eagle Pool & Ice Rink off Brush Creek Road, which has ample parking, to the trailhead at Arroyo Drive, which accesses popular trails including Second Gulch, Third Gulch and Bailey’s. While in the Second and Third Gulch areas, check out Eagle’s newest trail, the LOV connection, which connects the Third Gulch trail to the nearby Abrams Creek trail. Elk populations are in decline from Vail Pass to Aspen. It’s currently elk calving season, and protecting those declining herds of elk means respecting the trail closures that are in place. While many trails downvalley opened on April 15, closer to Vail that date also marked the closing of some trails for wildlife. In Vail, the North Trail system, the Son of Middle Creek trail and the Buffehr Creek trail closed on April 15 and will re-open on June 20. Vail resident David Ruttum lives near the North Trail and the Buffehr Creek trail and said he saw two elk cows with eight calves on the North Trail on Wednesday, April 11, just four days before the closure is to go into effect. “I will respect the closure rule and hope everyone else does, as well,” Ruttum said. The closure dates are based on the best available science in an effort to match the elk calving season, according to the U.S. Forest Service. “Mother Nature doesn’t always follow those dates, but we try to have something consistent so people understand and know that April 15 is the time they need to start staying away,” said Aaron Mayville with the U.S. Forest Service. Ruttum said he had never seen elk in the area before, and was skeptical of the claim that the area was important to elk calving. “Seeing the elk there at that time, just as the closure was going into effect, made me realize how legitimate this closure is,” Ruttum said. Mayville said while the Forest Service has enforced the closures in the past, the most effective enforcement comes from residents and neighbors like Ruttum, who can explain to would-be offenders that elk are in the area, elk populations are suffering in Eagle County and the closures are in place for a reason.